As Plant Based eaters we are often asked, “where do you get _____ from?”, “Are you getting enough _____?” Sadly, healthy plant based diets are often questioned whether to truly be good for you or not. Yet diets based mostly on processed foods don’t seem to get any attention. Something seems wrong here, doesn’t it? With that said – Zuzana and I decided to do a series of podcasts discussing individual deficiencies you may encounter as a plant based eater. As mentioned in our podcast, if you eat a healthy diet based mostly on whole foods – you probably are doing pretty good. If you do feel like you are possibly lacking something; I recommend to journal your food intake for few days. This way you can truly see what you may be lacking. Another strategy is to follow a meal plan that was properly designed with adequate amount of calories, right macronutrients and based around whole real foods. You can download our Free 7 Day Meal Plan HERE. 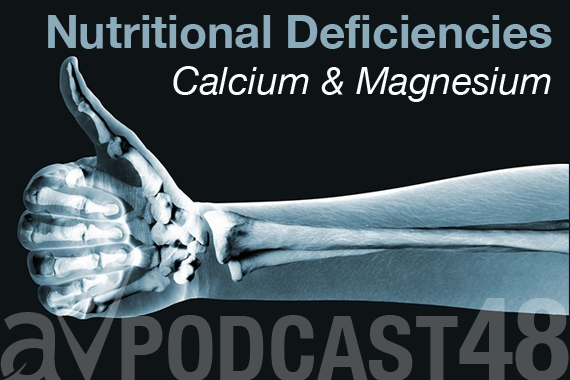 Today we are specifically looking at Calcium and Magnesium deficiency, how to recognize it and make sure you are getting the appropriate recommended daily intake. Calcium is the most abundant mineral in the body, present mainly in the bones and teeth. Our bones serve as a storage site for the body’s calcium, providing this mineral to the bloodstream for use by the heart and other organs. Eating a diet rich in calcium helps to restore it to the bones; otherwise your body will take calcium from your bones to keep blood calcium at normal levels. As mentioned above, calcium is integral when it comes to building strong bones and teeth. It is also crucial for maintaining a normal heart rate, powering muscle contractions, enabling the relaxation of your muscles, hormone function, and even blood pressure regulation. In other words, it affects your whole body and keeps you functioning optimally each day. Making sure you are getting adequate amounts of calcium from your food is important. The recommended daily intake of calcium is 1,000 to 1,200 milligrams per day, for ages 9 and up. Signs I May Be Lacking Calcium? Early stages of calcium deficiency are not easily recognizable. However, symptoms can develop if the condition worsens. Please remember – Zuzana and I are not health care practitioners and advise you to seek medical advice from your physician, if necessary. Where Do I Get Calcium? Signs I May Be Lacking Magnesium? Where Do I Get Magnesium? Try fermented foods and drinks. Fermented foods and drinks (such as sauerkraut, or kumbucha tea) populate your gut with probiotics (beneficial bacteria and yeast) that help your body absorb more magnesium from your food. If you think you might be more severely magnesium deficient (likely athletes) and want to improve your levels more quickly, you may consider a topical supplement. This can be with epsom salt baths or purchasing a magnesium oil or spray. Topical is best, since our skin is the largest organ and will quickly absorb and utilize the magnesium.